I was writing the draft of this week's blog in the waiting room of my husband's Oncologist. This was to be our first visit and I was already a bit weepy and nervous. I pulled out pen and paper to write what was on my heart, but I am always astounded as to what is on the "Father's heart", and what He desires to talk about. The Lord has really used FaceBook in my life in a very profound way. It has been through this source of social networking that I have become even more acutely aware of the value of both our Military and our Missionaries. (By the way, I thought I already well understood this fact). 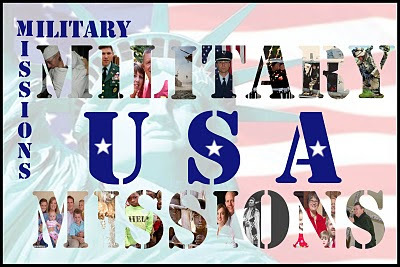 As I was waiting on the ideas for my blog to unfold ...I was astounded as to the similarities of those who are called to serve our nation as a missionary or member of the military. The parallell was so striking - it almost took my breath! Therefore, I will refer to them affectionately as the M and M's, "The caregivers of nations." Unfortunately, many of our Military are neglected missionaries. The advance of technology and selective media coverage, for better or for worse, has afforded the opportunity to witness up close and personal the intimate lives and tragedies of those whose relationships span time and distance. This includes the things we desire to be privy to and those we don't. As we hear stories related of another tragedy we can translate that into a moment of sadness on our way to have our nails done, the coffee shop or mall. Missionaries: Why lie when the truth would do better? B-O- R-R-R-I-N -G. Ashamedly, church attendance is the lowest during these services. How many times have you asked how was the service, and the answer was..."It was just a missionary?" Missionaries may or may not be great orators, not be able to deliver a comedic performance, or in actuality, their delivery may be as exciting as watching your hair grow. That is NOT the point! The M and M's confront us with facts and truths that we are not prepared to deal with.We as a Western society do not want to be confronted with anything/anyone who might pull us out of our comfort zone. Their lives are like a mirror that shines a burning light in the darkest corners of our selfish souls. In this digital age it is much too easy to look away when we are confronted with someone else's pain. We are almost embarrassed to witness someone else's struggle- regardless of the form it takes. Should we cross paths with the abused, neglected, orphaned, widowed, the halt, the maimed or the poor we turn off our media source with one quick action and no one else will know. If we can dash for the remote and turn the scene off quickly enough, we will not have to deal with the full brunt of emotions. Quick! Shut out those sights and sounds that evoke the swirl of discomfort! QUICK, TURN OFF/DELETE THE GUILT! Shut that thing off before it costs us something; our time, our prayers, or heaven forbid, our hard-earned finances! The M and M's sacrifice may require a sacrifice from us as well. If we tarry too long we might have to face our greatest fear...that one of our own would be called to foreign soil. The M and M's very choice of lifestyle is confrontational and challenges us to the core of our being. They prove daily their very sustenance and survival is dependent, often times, on a stranger within or without their own ranks. They are one of the truest examples of faith under fire. They are totally dependent on the miracles and mercies of God. Pride is not a luxury they can afford for they are both on a mission! Truthfully, we all have a touch of the selfish prophet syndrome. Moses, Jeremiah, Jonah were classic examples of this. The very presence of an M & M,whether it be physically/or by testimony, creates an element of conviction or shame by default. 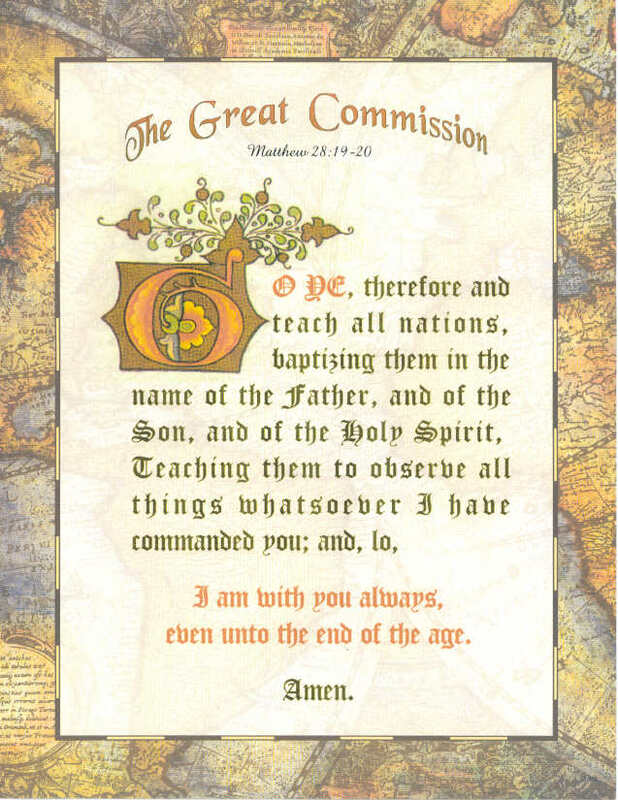 Honestly, God must have had someone else in mind other than me when the great Commission was written. It is a terrifying thought as to whose life is dependent on our actions and obedience to God TODAY! The reality of the Prophet Isaiah's words sticks in your throat..."Lord send me." We can't handle the responsibility of someone else eating, having water to drink, living, dying or being protected depend on a simple request or conviction from the Lord that He has been speaking to us about for days, months, or even years? Maybe the only request was for us to pray from the luxury and comfort of our own living room. The conviction of my own heart has at the least, been most uncomfortable. My heart swells anew with pride, aches a new ache, and grieves more deeply as we have considered so lightly the sacrifices of others. My eyes sting when I hear the National Anthem or the 'Prayer of Allegiance'. I take solemn note when one of our American flags has been posted at half-mast. 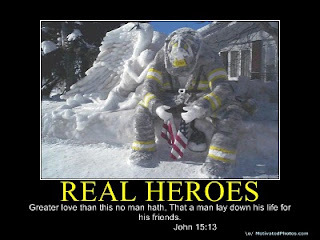 Each time I hear the name of another slain soldier, I pray for the families and their grief. I realize the holidays that honor our veterans consist of more than a summertime lark and a family picnic. I pray for every home that has a yellow ribbon tied around the old oak tree. I look for the pictures of the missionaries whose pleas are usually placed on an outdated church bulletin board. When the guest missionary proudly hands out business cards with their family's pictures listed with the nation they serve - I want one. I sympathize with their struggles as they step out of their lane to itinerate and plead their cause. I pay attention to the national unrest - chances are we have precious seed invested in that soil. I am more sensitive to the gentle nudging of the Holy Spirit to wake up and PRAY! II Chronicles :14 If my people, which are called by my name, shall humble themselves, and pray, and seek my face, and turn from their wicked ways; then will I hear from heaven, and will forgive their sin, and will heal their land. What do the M and M's have most in common? They have no fear of death! They have counted the cost down to the last penny, and still laid it all on the line; life and limb. Our Military and our Missionaries have looked the needs of a nation square in the eyes, and said, "Here I am Lord - PLEASE - SEND ME!". This blog is not to put condemnation on those who are not called to either of these stations of life. Just maybe... next time we could stop what we are doing - look and listen a little longer - pray a little more fervently - or dig a little deeper for those'who' are called. I would like to extend a special thank you to not only the Military and Missionaries, but to every person who holds an office of service and protection in our great nation! Please forgive us for taking our freedoms for granted! Nothing less than I expected from you.The truth and a challenge to all of us to be as committed to M&M"S as they are to us.As they say, "Lord, send me", we need to say Lord, it's me again exclusively for M&M's for this time. May we all ponder on the word you us and may we be better, selfless Christians. Cathy thankyou for this honest blog regarding missionaries. Yes, indeed that is what most of us missionaries feel and deal with. We pray for open doors and avenues to share our hearts and critical needs with. Because lives here and eternally depend on it. It can become so frustrating when we see how few people really seem to care; not by their words but as you have stated-in their pocket book. In low moments one is tempted to give up. We require funds to do what must be done and to get to where we have to go. That is the bottom line and all we want to do is be about the Father's work. Thank God for people who give sacrifically and catch the vision.